Michel Nedjar was born in 1947 in Soisy-sous Montmorency (France). In 1945, Jean Dubuffet theorize the concept of “Art Brut” rooted in the artistic production of the alienated or demented in psychiatric hospitals such as Heloise Corbaz or a spiritualist like Augustin Lesage as well as the production of the “common man”, uncultured author of unusual works characterized by a saturated support. These men and women are not interested in confronting themselves with art history and create for their own psychic necessity. Their works, also not meant for any particular destination, is closely linked with their inner self. 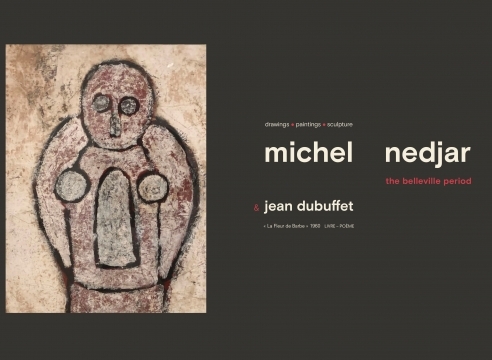 Just like André Breton before him, Jean Dubuffet recognized these works as authentic artworks that he will later gather in the world famous collection of Musée de l´Art Brut in Lausanne ( Switzerland). “Your art is very frightening, terribly tragic. But life is very tragic, so it is better to face it than to misrepresent it. Better not to dissimulate where and whom we are. You are representing life in a very strong manner and with uncommon potency”. Michel Nedjar was born in 1947 en Soisy-sous-Montmorency of a polish Ashkenazi mother and a Sefaradi algerian father, a tailor, who transmitted his son with his passion for textiles. As a child, Nedjar started making clothes for his sister´s puppets while helping his grandmother sell rags in her Paris flea market store. Aged 14, Nedjar left school and started learning the tailoring trade. At that time, he watches Alain Resnais movie “ Nuit et Brouillard” and becomes conscious that most of his family had disappeared or been exterminated during the Holocaust. This experience would remain the most tragic event of his adolescence and life. In 1976, after a deep depression, Nedjar starts making his first “puppets” out of sewn fabrics. In 1984 together with Claire Teller and Madeleine Lommel, Michel Nedjar pioneered the collection of Art Brut “L’Aracine” culminating in 1996 with a donation of 3,500 works to the Lille Museum of Modern Art (LAM) in Villeneuve d’ Ascq.